Overdrivepedal med to moduser; Boost og Normal. Ever since Goree Carter released his 1949 single ”Rock Awhile”, distortion has been the most favored guitar effect in history. Before overdrive/distortion pedals, cranking a small tube amp to max, or even slicing the speaker cone with a razor blade, was common practice to achive the sought after distortion sound. Since the first Fuzz-pedals of the 1960’s, a world of great pedals has built the foundation of rock music as we know it today. 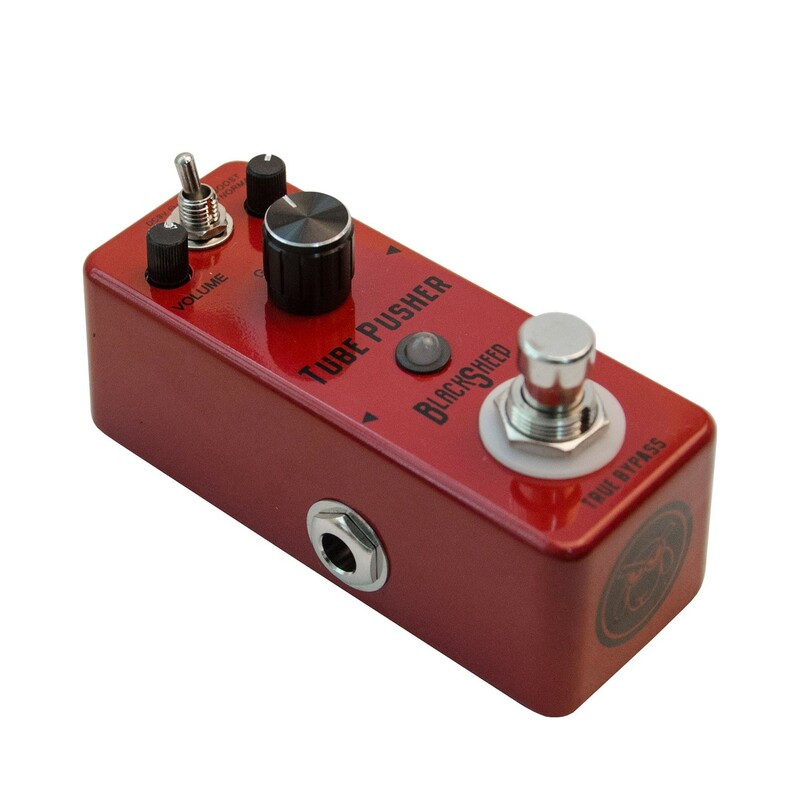 Black Sheep pedals are proud to offer boutique quality pedals at prices every guitar player can afford. The Black Sheep Tube Pusher is a compact, true bypass, sturdy built Overdrive pedal, with a wide span of sounds that will cover most needs, from bluesy leads to full on hard rock. It has an ultra wide dynamic range and extraordinary open tube-like drive sounds based on classic overdrive pedals from yesteryears. Boost: High peak mode, boost up the bottom end, when increasing distortion by Drive knob, you will get more volume and a slight increase in high-mid range (around 3.5KHz). Normal: Low peak mode, color up extremely little to the original sound, very nice for clean boosting. The Tube Pusher is very simple to use, with Volume, Tone and Gain to fine tune your sound. It runs on any standard Boss-type power supply, 9V DC. With it’s tough aluminium chassis, and also chassis mounted DC inlet, you can take this pedal on the road without any hazzels. Tube Pusher delivers a big and massive sound at at affordable price.